I do miss the days that my father would come home from work carrying a ja'beh shirini (box of sweets) freshly baked from our local bakery store. He'd almost always walk in through the doors with either some seasonal miveh (fruits), naan (bread), or shirini (sweets). And those delicious sweets would be just as enjoyable for my father as it was for the kids. How could the taste of baghlava make such an everlasting impression upon my mind? Was it that it was brought home by my father usually for Nowruz (Persian New Year) and I would get to eat it while sitting next to him, hearing him make his usual "mmm" sound with every bite? Was it that most desserts tasted delicious as a kid, let alone the most traditional desserts that were made to perfection? Or is it the nostalgic memories of childhood that turn the flavors and aromas into a wonderful experience? 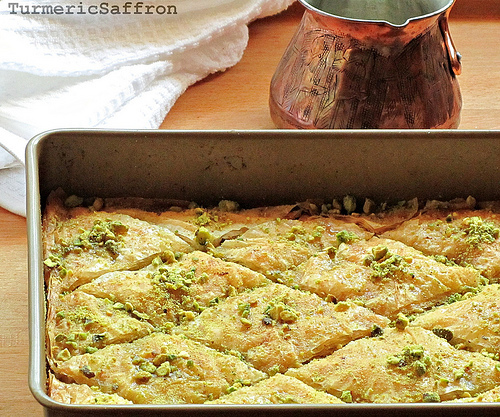 باقلوا Baghlava (baklava) was a favorite in our home back then and happens to be a favorite among my own family now. 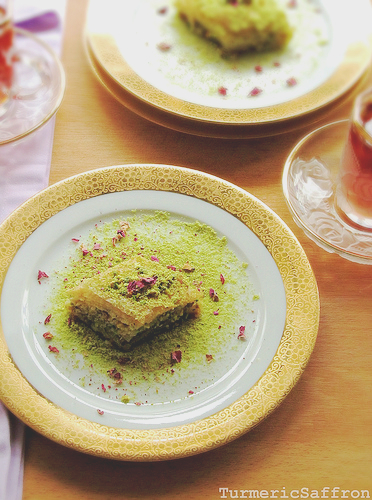 Who doesn't love the decadent taste of baghlava, followed by sips of hot tea or coffee? You can use a combination of any finely ground nuts for the filling, make stacks of several layers of dough and fillings to bite into, or make it as syrupy as you like. However, Persian baghlava is neither chunky or too gooey and is usually made with pistachios and skinless almonds along with ground cardamom and the sugar rose water, saffron syrup. The best baghlava in Iran is from the city of Yazd. In a medium sized bowl combine the chopped almonds, pistachios, two tablespoons sugar and the ground cardamom. Mix well and set aside. Combine sugar and water in a small pot and bring to a boil on medium heat for about 15 minutes until sugar is completely dissolved. Add the saffron to the syrup, lower the heat, simmer for an additional 5-7 minutes. Remove from heat, add the rose water and allow to cool. Lightly butter the inside of the baking pan. Place the first phyllo dough sheet down and lightly brush the melted butter across covering the entire surface. Add four more pieces of phyllo dough and lightly brushing each with melted butter. Add a layer of ground almond/pistachios. Add five more pieces of phyllo dough sheets lightly brush each sheet of phyllo dough with melted butter. Add another layer of the chopped nuts covering all areas. Place five more pieces of phyllo dough, lightly brushing each with butter. Cover the phyllo dough sheets with another layer of the crushed nuts. Place the last five layers of the phyllo dough sheets and brush the surface with butter. With a sharp knife cut across diagonally to make diamond shapes. Place the baking pan on the center rack of the 350 degrees Fahrenheit preheated oven for 30 minutes or until the top is golden. Take the tray out of the oven and turn the oven off. Pour half of the cool syrup all over the baghlava and place it back in the oven for 5-7 minutes. Remove the pan from the oven and pour the remaining syrup over the baghlava and let cool for at least a couple of hours before serving. (It tastes much better the next day so you may want to make it ahead of time). 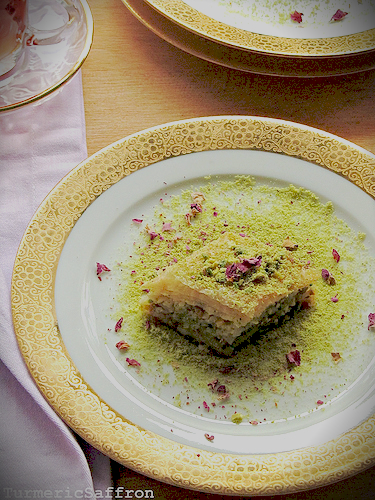 To sum it all up, this recipe has 4 layers of 5 phyllo dough sheets and 3 layers of ground almonds and pistachios. It keeps well for a few days but more than that I couldn't tell you! Garnish with chopped pistachios, almonds or crushed rose petals and serve with hot tea or coffee.